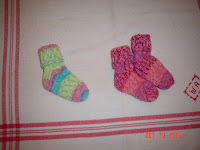 These are the baby socks I have been working on for two weeks. I am on my 4th pair, I think! (I've lost count!). 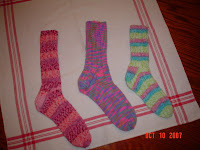 I knit two other pair, one in the colorway on the left and one in an orange colorway for a friend of my daughter who is expecting a little girl. The yarn is Encore Colorspun. It is my favorite yarn right for socks right now. 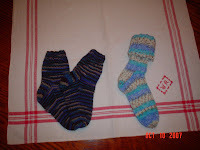 These are socks that I have knit for Christmas presents. Most of them are made from about 3 patterns that I seem to have figured out. They are not complicated, but I guess I need to start some where! Most of them are knit in Encore Colorspun except for the camouflage slmaller ones in the left of the bottom photo, which were "requested" by my youngest grandson.